The German Chancellor, Angela Merkel said her conservative party unanimously condemned all anti-Semitic acts such as burning of Israeli flags and said the government should use all instruments at its disposal to combat such incidents. "We condemn all kinds of anti-Semitism and xenophobia, and no disagreements, not even over the status of Jerusalem, justify such actions," Merkel told journalists after a meeting of the leadership of her Christian Democratic Union (CDU). Around 2,500 people demonstrated at rallies in Berlin and other cities over the weekend in reaction to Donald Trump’s announcement that the U.S. government would recognise Jerusalem as Israel’s capital. On Friday hundreds of people had gathered outside the US embassy in Berlin for "Day of Rage" protests called for by Palestinian and Hamas authorities. Police said they had detained 10 people during that protest and brought criminal charges against 12 people, including for burning Israeli flags. 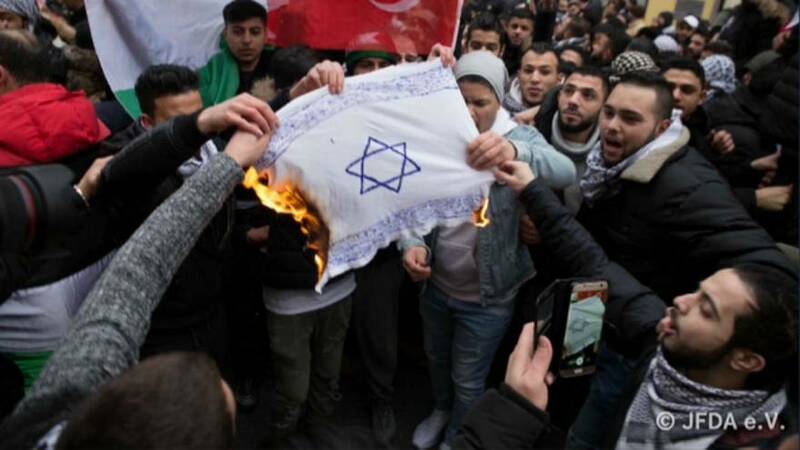 In an article for the newspaper, Rhein Neckar Zeitung, Josef Schuster , head of the central council of jews in Germany called for the immediate dissolution of any demonstration where Jewish symbols are defiled. More than 70 years after World War II, in which Germany killed 6 million Jews, anti-Semitism remains a sensitive issue in the country. Germany considers itself to be one of Israel’s closest diplomatic allies.